The book provides detailed solutions for data structure and algorithm related questions in previous years GATE Papers. Summary Of The Book Algorithms and data structures are fundamental concepts in computer science, programming and related courses. A good understanding of these concepts are required in the workplace as well as for higher studies. For a person aiming to gain entry into postgraduate courses in IT related fields, this knowledge is of utmost importance. For students who have finished their bachelor degree in computer science, this might not be a problem. They might have a good understanding of these concepts. Still, when appearing for an exam like GATE, they will need to tackle challenging questions on these topics. Data Structures And Algorithms For GATE: Solutions To All Previous Gate Questions Since 1991 helps them by concentrating on the concepts and codes that are directly relevant to competitive exams and interview situations. The book covers theorems and proofs for data structure and algorithm related concepts. It provides different solutions, in varying levels of complexities for the same problems. This will help the students understand many possible solutions to a specific problem. The book concentrates more on problem solving than on the basic theory, for it is assumed that readers at this level understand enough of the theory to tackle various kinds of problems. This book will help readers prepare for competitive exams, for interviews, and even serve as basic reference material for higher studies. Instructors might also find this book useful, as it provides multiple solutions to various problems and discusses the solutions too. 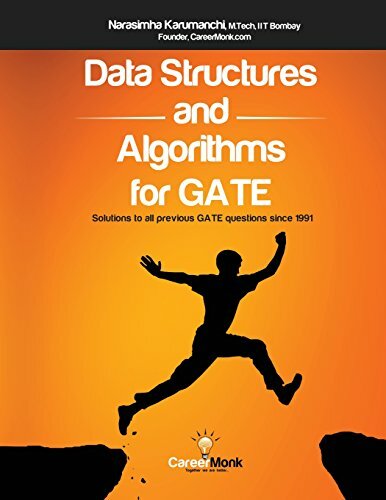 Data Structures And Algorithms For GATE: Solutions To All Previous Gate Questions Since 1991 will be especially helpful to GATE aspirants for it contains detailed solutions to questions from previous twenty years of GATE Papers. All the codes in Data Structures And Algorithms For GATE: Solutions To All Previous Gate Questions Since 1991 have been written in C. The book covers data structure topics like linked lists, stacks, queues and trees. It also covers recursions and backtracking. The book discusses various algorithm concepts like searching, sorting and graph algorithms. It goes into string algorithms, hashing techniques and symbol tables. The book also looks into interesting and complex algorithm concepts like dynamic programming, divide and conquer algorithm and greedy algorithms. About Narasimha Karumanchi Narasimha Karumanchi is an experienced software designer and developer. Other books by this author are Peeling Design Patterns: For Beginners And Interviews, Coding Interview Questions, and Data Structure Puzzles: Puzzle Your Mind For Data Structures. He specializes in covering programming and data structure concepts for competitive exams and interviews. Narasimha Karumanchi studied for his B.Tech in computer science at JNT University. He earned his M.Tech from IIT, Bombay. He has worked for Mentor Graphics, Microsoft, and IBM Labs. He also has teaching experience, having taught algorithm and data structures at colleges and training centers. Currently, he is Senior Software Developer at Amazon Corporation. Buy the book Data Structures and Algorithms for GATE: Solutions to All Previous GATE Questions Since 1991 from Ideakart.com.